Heavy bags are an essential part of Muay Thai training. They can help you hone your offensive skills from the comfort of your very own home. 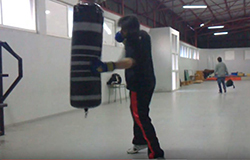 Heavy bags are designed to take a beating so that you can increase your power, dexterity, and overall technique. Best of all, heavy bags take the place of another person. You can train to your heart’s content without having to worry about another person’s safety. A high-quality bag will let you master your craft on your own time from wherever you want. In the past, fighters were limited to training at the gym or creating bags out of objects they find around the house. However, modern enthusiasts have a range of choices. But Which Bag to Choose? The market is flooded with bags of all shapes, sizes, and materials. Manufacturers offer numerous designs to accommodate fighters of any skill level. To ensure that you’re getting the most bang for your buck, you need to invest in a bag that can keep up with your training regime. It’s important that you consider all of your options and find a bag that’s safe and efficient for your particular skill level. Here’s a list of some of the best heavy bags that money can buy. 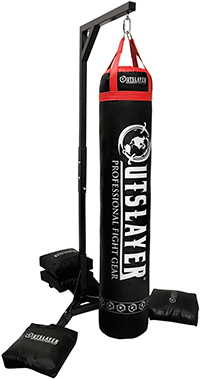 This bag from Outslayer can serve fighters well regardless of their skill level. It measures approximately 72 inches tall, providing you with more than enough room to get your strikes in. The bag is attached to four 12-inch straps. The straps have four layers for extra strength and have an attached D-rings for easy mounting. Inside the bag is compressed textile filler. This high-quality filling material offers excellent shock absorption and impressive durability. It’s consistent in terms of performance and isn’t affected by frustrating lumps. The exterior of the bag is made from slick vinyl for toughness. Overall, the heavy bag weighs 130 pounds. If you’re looking for something a bit lighter, consider this 100-pound option from Combat Sports. The heavy bag comes pre-filled with durable textile filler. It holds up well to years of training. The fabric inside helps to create a striking surface that’s firm enough to strengthen your muscles but soft enough to absorb shock. The outside of the bag is made of synthetic leather. It measures 6 feet tall and comes with attachment chains. The chains are connected to the bag via nylon webbing. The webbing is reinforced to prevent tearing during intense sessions. This bag from Ringside is built to last. 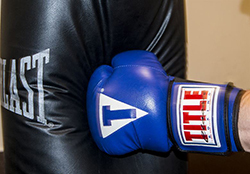 It’s designed to be used by novice and experienced fighters alike. The body of the bag is made of a smooth synthetic material. It’s free of any raised labels or indentions, allowing you to strike without getting scraped or cut. The manufacturers utilized a unique powerhide construction method. This ensures that the bag stays together no matter what you throw at it. It has textile filling inside to make your training experience comfortable and efficient. Chains on the top of the bag can be used to attach the unit to the mounting device of your choosing. Made from cowhide leather, this bag from Title can take a beating. The leather material is smooth and resilient. Towards the top of the bag are loops to accommodate the included chains. Each loop is has reinforced stitching for strength. A total of 6 chains are used mount the bag. There’s even a D-ring at the bottom to attach an additional chain that controls swivel. The bag uses textile filler for versatility and shock absorption. It’s accompanied by a thick foam liner. 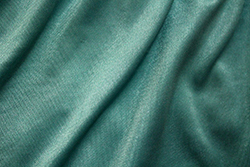 The liner surrounds the textile to add an extra layer of softness and protection. The Everlast Omni bag is designed to provide you with a versatile training experience. It’s relatively light, weighing in at only 80-pounds. However, the bag includes ample padding and protection to keep you safe. The bottom portion of the bag is wrapped in foam so that you can kick low with confidence. The rest of the striking surface is covered in premium synthetic leather. Two handles on either side of the bag allow you to practice grips. Nylon straps at the top of the bag make it easy to hang on a mount. The straps are riveted for strength. There’s also a double end anchor on the bottom. A heavy bag is only effective if it’s mounted properly. There are a few different options to go with when you’re planning your purchase. The right choice for you comes down to personal preference and the space in which you plan to train. Before you make a decision, it’s important that you take a look at your training space and plan accordingly. It’s also a good idea to keep the various advantages and disadvantages of each system in mind. Free-standing mounts are a great option if you plan on changing training locations frequently. They don’t require any permanent changes to the structure of your home or gym. Stands are typically made of durable steel and require a bit of assembly prior to use. Once they’re set up, stands will keep your bag in place as you train. 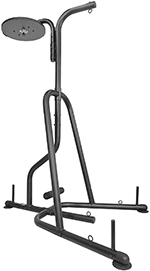 Complete speed and power training sessions with this free-standing mount from Titan Fitness. It’s made of thick steel tubing that’s been powder-coated for durability. The stand comes in various parts that can be assembled in only a few minutes. The unique thing about this stand is that is can accommodate a heavy bag and speed bag. The heavy bag side can hold units up to 100 pounds and measures 80 inches high. The speed bag side measures a little over 83 inches high. To improve stability as you train, the stand has 3 weighted plate pegs. They’ll keep the unit on the ground no matter how hard you punch. Wall mounts are designed to be a more permanent fixture in your training space. Mounts are built out of heavy steel and are designed to hold the weight of the bag against the wall. Most mounts require a bit of assembly prior to attaching it your wall. They also need strong wall studs. This wall mount can handle bags weighing up to 100 pounds with ease. It’s strategically designed to keep your bag stable while you train. The mount is made of solid steel that’s been powder-coating with a red oxide formula. This treatment helps to prevent corrosion over time. On top of the mount is a swiveling eye bolt. To ensure that the mount stays put, there are 8 separate bolt points. A pull pin adjustment system allows you to fine-tune the bag’s placement or rotate it out of the way completely when it’s not in use. 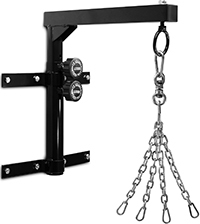 Hanging mounts are often used in professional gyms and training centers. Like wall mounts, they’re installed permanently on the building’s structural components. They’re best for spaces that have a moderate ceiling. Because they’re hung from the ceiling, they offer more flexibility in placement. This stand from Outslayer is capable of holding a bag that weighs up to 350 pounds. It’s made of heavy-duty steel that’s been treated to avoid deterioration over time. The unique frame shape provides versatility in placement and use. It can be positioned in a corner or in the middle of the room. Each support leg is approximately 30 inches long and can be lengthened an additional 15 inches if needed. The stand is designed to hold the bag away from the main vertical pole. It extends approximately 3 feet out. To add stability, the stand comes with 4 unfilled sandbags. When filled, they weigh about 60 pounds each. What is the Best Filling for a Punching Bag? One big factor you should consider prior to making a commitment to a bag is the material inside. The filler material can make or break the training experience. Manufacturers can utilize a variety of different materials. Some even utilize a combination of materials to create something unique. Each filler comes with their advantages and disadvantages. Beyond the way a material feels, the filler can directly affect the bag’s overall safety. It’s crucial that you choose an option that’s suited to your fighting style and skill level. A heavy bag that’s too firm may result in serious injuries. The force of each impact can lead to unnecessary stress on your bones, joints, and tendons. Ultimately, this can lead to broken bones. Heavy bags that are too soft also pose a number of problems. Training on a softer bag can affect your progress and increase your chances of injury. You can hit the bag too hard, causing the bag to fall onto you. The key to finding the right bag is to figure out a balance of softness that works for you. Here are some of the most common filler materials. 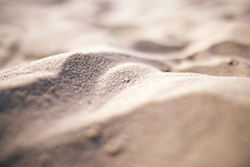 Sand is one of the oldest fillers around. It’s been used throughout history and continues to be a favorite amongst Muay Thai fighters for its versatility. Sand is easy to work with. It’s easy to fill, pack, and redistribute. Some downsides to sand are its tendency to get hard and lumpy. If it’s not moved around on a regular basis, the sand can settle and become hard. These hard portions of sand can pose a significant safety risk if not dealt with. This filler is a great option that has impressive shock-absorbing qualities. Textile filler is comprised of recycled fabric that’s torn up and compressed. It’s much softer than sand and can be used with lightweight gloves. There’s also no need to worry about pitting or lumpiness as long as you move around the bag and don’t stick to one spot. One disadvantage of textile is that it can be difficult to work with. It’s not as easy to remove or add new fabric when you want to change up the training experience. On the plus side, bags with textile filler are known for their longevity. Foam is a popular choice among modern fighters because of its affordability. High-density foam is used to provide superb shock-absorption and distribution. This type of filler is commonly used on bags that are specifically designed to be portable. They’re much lighter than the previous options and can be carried to your next training location. Some issues that fighters may experience is the shorter lifespan of the foam. While it’s designed to take a beating, the material can become damaged over time. The lighter weight also leaves much to be desired for enthusiasts that want an option that imitates the weight of an actual person. With all the great options on the market, you won’t have any issues finding that perfect heavy bag. With a bit of planning, you can get a bag that works for you and your home training space.